FM Global provides comprehensive industrial property insurance worldwide, along with underwriting, risk management solutions and property loss prevention guidance. Their property loss prevention data sheets provide detailed recommendations related to transformer fire protection, and state different requirements for transformer fluids that have FM Less Flammable Fluid Approval i.e. have been proven to have increased fire safety. MIDEL 7131, MIDEL eN 1204 and MIDEL eN 1215 are FM Approved Less Flammable Fluids which offer substantial fire safety and civil installation cost advantages, based on the recommendations within the property loss data sheets. The example below shows a transformer room within a building containing 2 x 11kV 1250kVA distribution transformers, each containing 500 litres of fluid. If these transformers are filled with mineral oil they will each require individual containment & drainage, along with 3-hour fire rated walls, partitions and exposed structural steelwork. 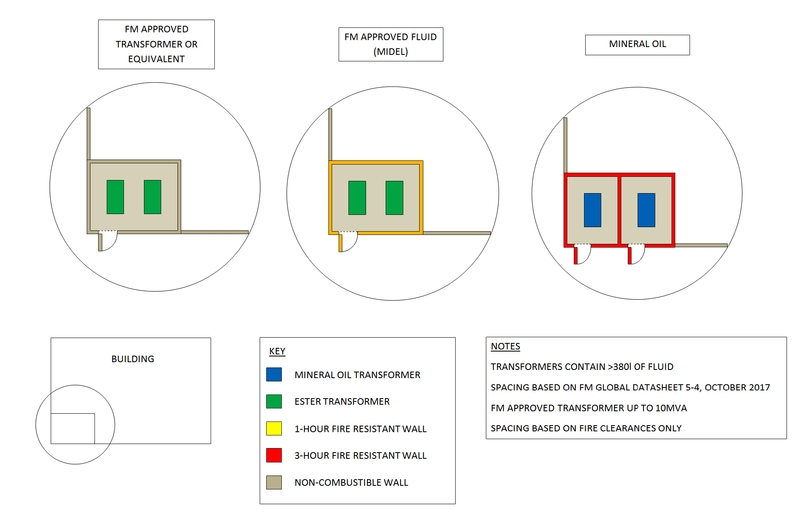 If these transformers are filled with MIDEL fluid there is only the requirement for a 1-hour fire rated wall, no partitions needed, and the two transformers can share containment & drainage. The example below shows 2 medium power transformers, each containing between 19,000 and 38,000 litres of fluid, installed outdoors near a main building. If filled with mineral oil fire barriers will be necessary between the transformers and the main building to reduce separation. In this example it is assumed that the building has a non combustible wall. If the transformers are filled with MIDEL fluid, there is no requirement for fire barriers and the minimum separation distances are reduced to 1.5m, substantially reducing the transformer installation footprint and civil engineering costs.